hearing :: rhett miller’s new record – for free. smelling :: brand new library books. seeing :: my sanity directly affected my the amount of uninterrupted sleep i’ve gotten the night before. thank goodness we don’t have a new-born or i’d need to go to the nervous hospital. feeling :: l.o.v.e.d. – today is my 11th wedding anniversary. 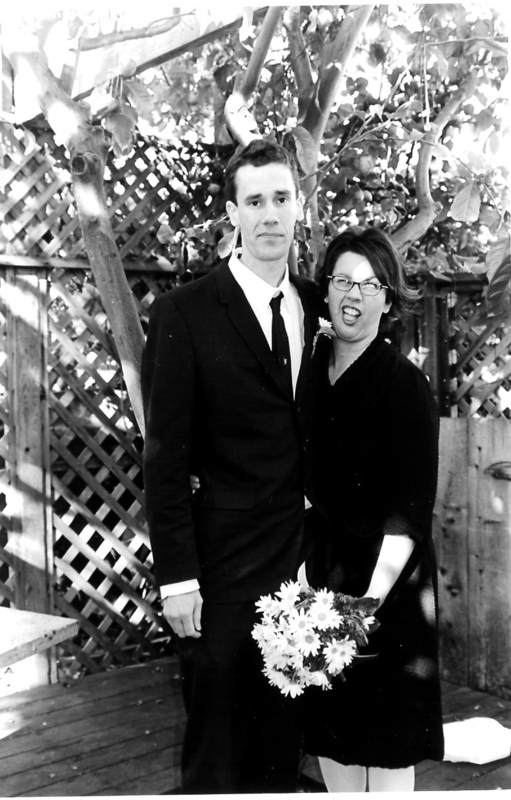 ps this is our only framed wedding picture. i have my “i’m drunk and 30 face” on. wishing/hoping :: wishing my sweetheart a very happy anniversary and hoping everyone and their grandma comes to alicia’s presale and completes their holiday shopping while helping a great cause. This entry was posted in Saturday Senses and tagged best wedding picture ever, weekly check in by Teacher Goes Back to School. Bookmark the permalink. Happy anniversary! That is the most respectable wedding picture in the history of the planet. I love you guys! I don’t know what’s funnier — your face or Jed’s! :) Happy anniversary!! That photo is too funny. If that’s the way your marriage started off, you two must have a great time together. Here’s to decades more of happiness. And OMG! Don’t you just LOVE Rhett’s cover CD? The Bowie tune, especially Bewlay Bros are my favorite. I cannot stop playing BB.